When we first meet Patroclus he is a young prince, awkward in his own skin, and definitely feeling that he is seen as a disappointment to his father. 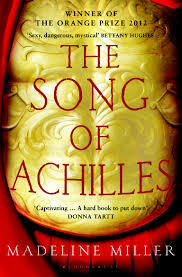 When he is exiled to the kingdom of Phthia, Patroclus comes to spend time with Achilles – the boy who is rumoured will grow up to be the greatest Greek fighter of all times. We watch the boys grow up together and, even though they are very different, they form a strong bond. This disappoints Thetis, the mother of Achilles, who does all she can to separate the two young men. An interview I read with Miller while I was reading this talks of her desire to understand why a character such as Achilles acts as he does (which didn’t seem to be of much interest to Homer). This, I think, explains why the first half of the book feels rather slow-the relationship between Achilles and Patroclus has to be established so that we understand the love they share. Once we venture into the war of Troy, Miller’s writing really came into its own for me. Richly evoked, while holding little back, and seamlessly blending the worlds of mortals and gods. The concepts explored in this story are, indeed, timeless and it really made me wish I had more than a passing acquaintance with some of the stories of Greek mythology. For anyone who thinks Classics is a dull subject…I’d say read this and you may be pleasantly surprised.